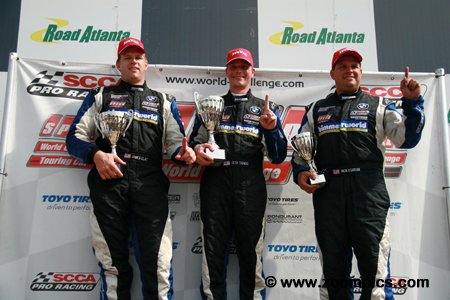 In 2009, the Sports Car Club of America’s (SCCA) World Challenge series was in its 20th-season. 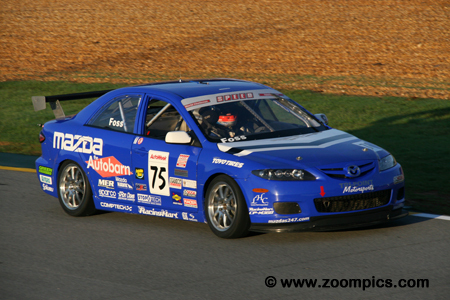 The SCCA had developed a successful format that attracted competitors and fans. Most race weekends included two standing start races with a time limit of 50-minutes. One event for the Grand Touring (GT) class and another for the Touring Cars (TC). Grand Touring (GT) – The GT class rules accommodated a large range of vehicles from different manufacturers. Engine displacements ranged from the 2.5-litre turbocharged Volvo S60R to the Dodge Viper with an 8.3-liter V10 motor. While most of the cars were rear wheel drive, the series also permitted all-wheel-drive vehicles such as the Nissan Skyline GT-R, Porsche 911 AWD TT, Subaru WRX STI and Volvo S60R. A majority of the competitors raced the Chevrolet Corvette, Porsche 911 GT3 or Dodge Viper. Touring Car (TC) – The Touring Cars were limited to an engine displacement of 2.8-liters. Vehicles originally equipped with turbocharged or supercharged motors were also homologated for the series. The class was split predominantly between front wheel drive cars from Acura, Honda, and Mazda and the rear wheel drives such as the BMW 328i. To prevent any driver/car combination from dominating the class and ensuring tight competition, the R.E.W.A.R.D.S. system was implemented. Introduced in 1995, R.E.W.A.R.D.S. is the acronym for ‘Rewarding of Equalizing Weight Assigned to Reduce Driver Sensitivity'. This weight equalization rule added or removed ballast from a car based on the finishing position of a driver. The maximum amount of weight that could be removed from a car was 100-pounds. And, no more than 200-pounds could be added to a GT class car and 150-pounds to a Touring Car. There were nine-race weekends during the 2009 season – ten-races for the two categories. The Touring cars did not compete at Long Beach. 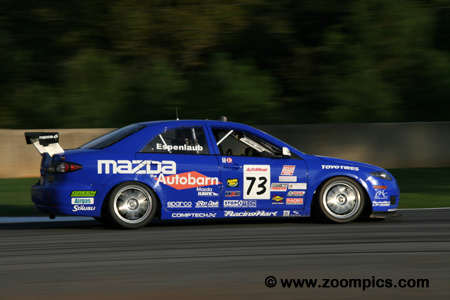 However, they raced twice at Mosport Park. As in 2008, the opening round was in March at Sebring, Florida and the championship ended in October at Mazda Raceway Laguna Seca, California. 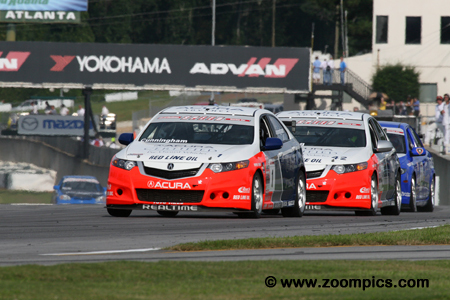 Round nine of the 2009 World Challenge Touring Car Championship was held at Road Atlanta. Drivers would compete for twenty-seven laps around the twelve-turn 2.54-mile road course. The 2009 World Challenge Touring Car grid for the penultimate round. There were fourteen entries for round nine at Road Atlanta. With the season coming to an end there were only three drivers that had a shot at the title. The best chances lay with point’s leader, Jason Saini. RealTime Racing teammates and former class champion, Pierre Kleinubing and Peter Cunningham, were also in the running to earn another title. Kuno Wittmer was quickest during the two practice sessions but his performance slipped during qualifying. A coin toss was used to determine if the five fastest cars would be inverted for the start. The coin landed in Wittmer’s favour; he moved from fourth on the grid to the outside of the front row. 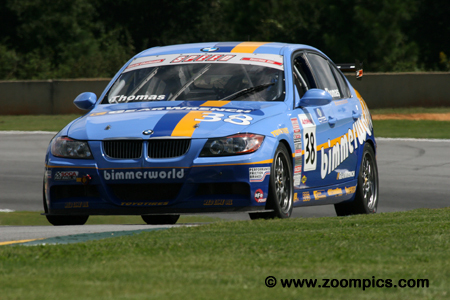 During the race, Wittmer could not match the pace of the BimmerWorld BMWs and was passed by Seth Thomas and James Clay - he finished fourth. Driving the No. 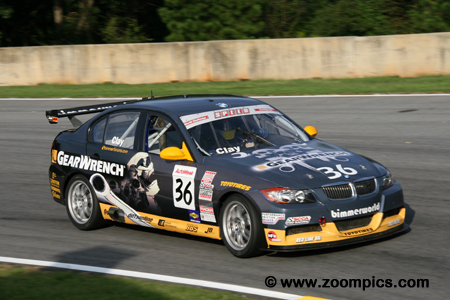 38 BimmerWorld/Gear Wrench BMW 328i was Seth Thomas. Starting from the third position on the grid, Thomas slipped by Kuno Wittmer at the beginning of the race. For the next fourteen laps, he appeared content to draft his teammate and race leader, Nick Esayian. By the fifteenth circuit, he was in first place and led the remaining twelve laps. This was his third victory of the season. James Clay was the quickest at the end of the Touring Car qualifying session. Unfortunately for Clay, a post-qualifying coin toss determined if the top-five starters would be inverted – he lost and would be fifth on the grid. At the start, Clay battled with Kuno Wittmer and Eric Foss. By the sixth lap, he had overtaken them and set his sights on his teammate, Nick Esayian. Clay got around Esayian on lap-20 and finished 1.692-seconds behind the winner, Seth Thomas. The coin toss worked in Nick Esayian’s favour. Esayian was the fifth quickest during qualifying but James Clay’s decision to choose tails rather than heads gave Esayian the pole. Driving the No. 34 BMW 328i he made a great start and led the first fourteen laps before he was overtaken by his teammate, Seth Thomas. On lap-20, he was passed by his other teammate, James Clay. Esayian finished third, earning his first podium finish. The only driver quicker than Peter Cunningham in the two practice sessions was his teammate, Kuno Wittmer. The defending champion, Cunningham drove the No. 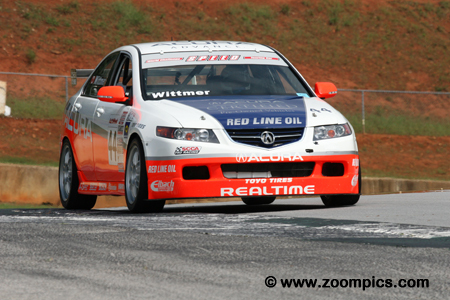 1 RealTime Racing Acura TSX. In qualifying, the performance of his competitors improved and he was only able to record the seventh fast time. At the checkered flag, Cunningham was sixth but maintained his third place in the driver’s standings. Rookie, Eric Foss had a nasty crash during the test day but the team had the car repaired and ready to run for official practice. They must have done a good job because Foss was the third quickest at the conclusion of the two practice sessions. He was second fastest in qualifying but after the coin toss, he would start the contest in fourth. During the race, Foss battled with James Clay and Kuno Wittmer – eventually finishing fifth. Jason Saini had wins at New Jersey, Autobahn and Mid-Ohio and was leading the Touring Car standings heading into the penultimate round. Saini’s closest rival for the title was RealTime Racing’s Pierre Kleinubing. He led Kleinubing by forty-six points. At Road Atlanta, Saini did not have a great race and finished in eighth place. 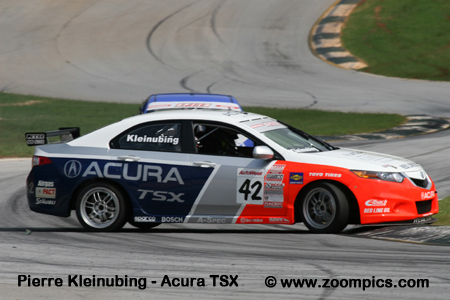 However, he increased his cushion as Kleinubing was tenth at the checkered flag. 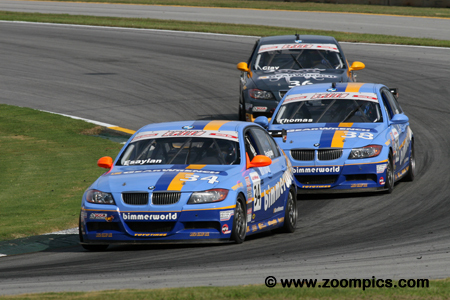 It was a clean sweep of the Touring Car podium at Road Atlanta for the BimmerWorld team. On the right is third place finisher, Nick Esayian. After competing in the series for seven years, this was Esayian’s first top-three finish. On the opposite side of the podium is the fastest qualifier and runner-up, James Clay. In the center, scoring his third win of the season is Seth Thomas.